Oh hayyyy, everyone! Did you miss me? I hope so. It’s been awhile. Well, I’m here now, gracing the internet/world with this post. I know, it’s amazing. Just kidding about the amazing part, but I do feel the need to talk myself up since I’m spending time writing this instead of studying for my allergy boards. Yes, I’m taking some eggs out of the “allergy” basket and putting them into the “blogging” basket. I’ll let you know how that pans out for me in the next few months (i.e., whether I pass my boards). I’m going to skip over catching you all up on my summer (punch line: it was not great), and get right to the food. For the first time ever, I have a vegetable garden! I’ve been looking forward to having one for years, and this year, it happened. In May, we (Diran) made two garden boxes for raised beds. We filled them with soil, and planted all sorts of things: lettuce, kale, cucumbers, tomatoes, eggplants, jalapeños, rhubarb, scallions, and chives. Then, we waited. By June, we had lettuce and kale, which were great. Slowly through July, August, and even now, we’ve harvested some of everything! Highlights have been the cherry tomatoes and eggplant, which are the best I’ve ever had. Why am I writing all of this garden stuff? It’s important, I promise. I mentioned that the eggplant were the best I’ve ever had. Like, I dream about them, they’re that good. The problem is that they’ve been a little slow to grow. Well, finally, three grew at the same time, and had been sitting in my fridge for a day. Between those, the squashes that my mom brought from a friend’s garden, and all the tomatoes, it seemed like I should use everything up. Diran suggested that I make dolma, which could tie all of these foods together. It sounded good to me! 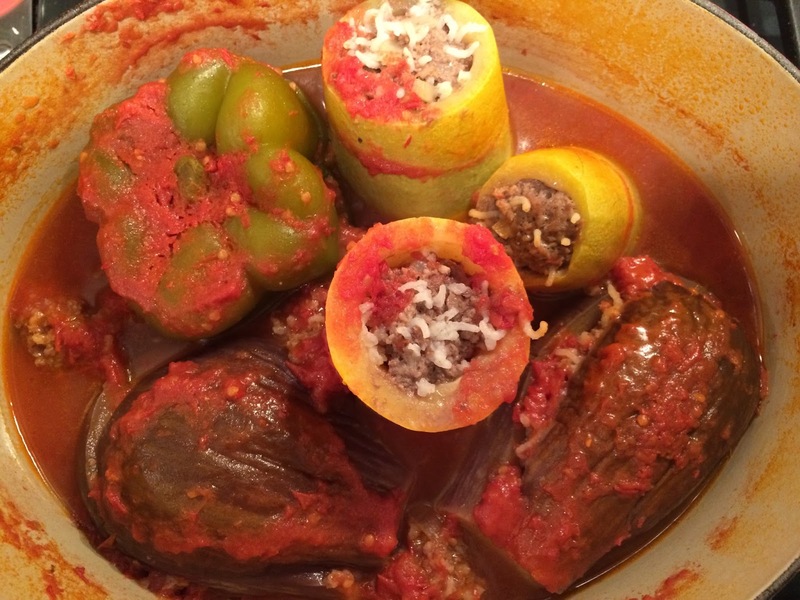 Dolma is one of those Armenian treats that you hope your mom will make for you when you go home to visit (right, Armos?). 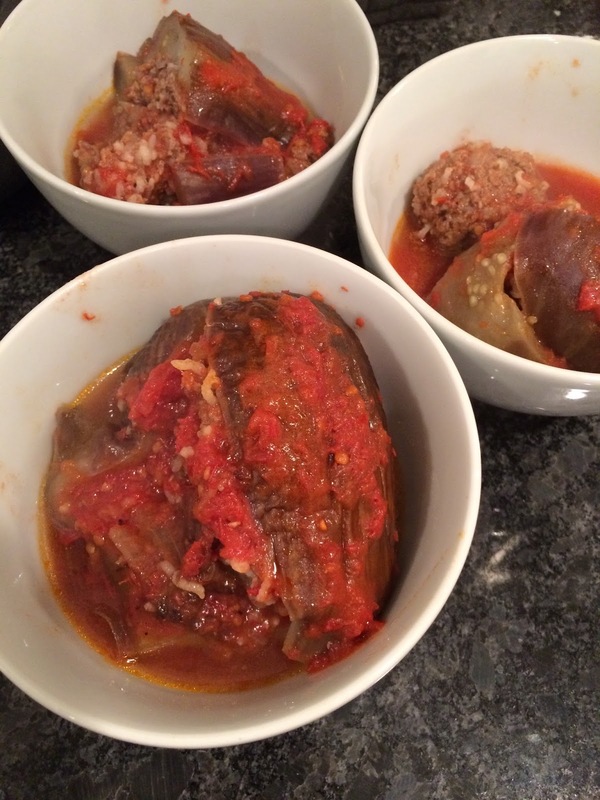 It’s a mixture of seasoned meat and rice that is stuffed into vegetables and cooked in tomato sauce. If that doesn’t sound good to you, then close this internet window now and never come back to my blog. If you are interested, keep reading. My mom always stuffed tomatoes, peppers, and zucchini. Other people use grape and cabbage leaves. And other other people (me, last night) use eggplants from their garden(!). 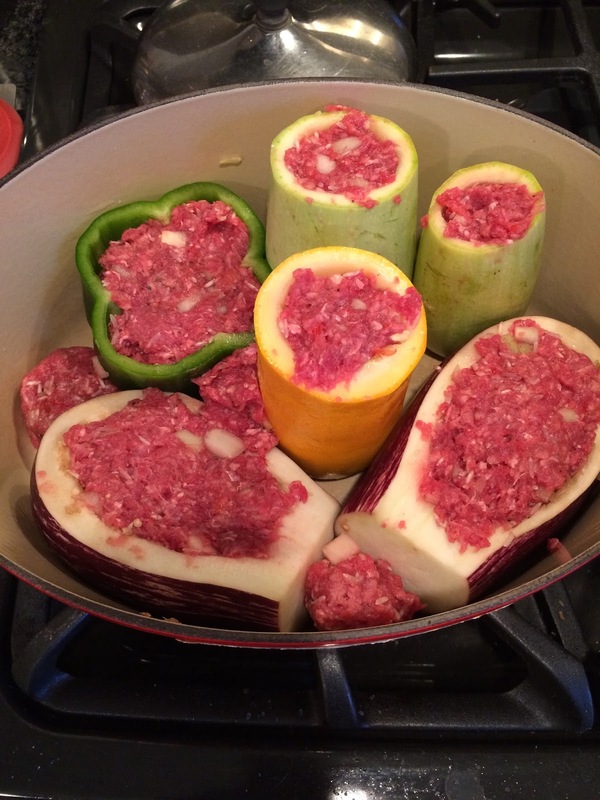 There is almost no wrong way to make dolma, I’ve decided. 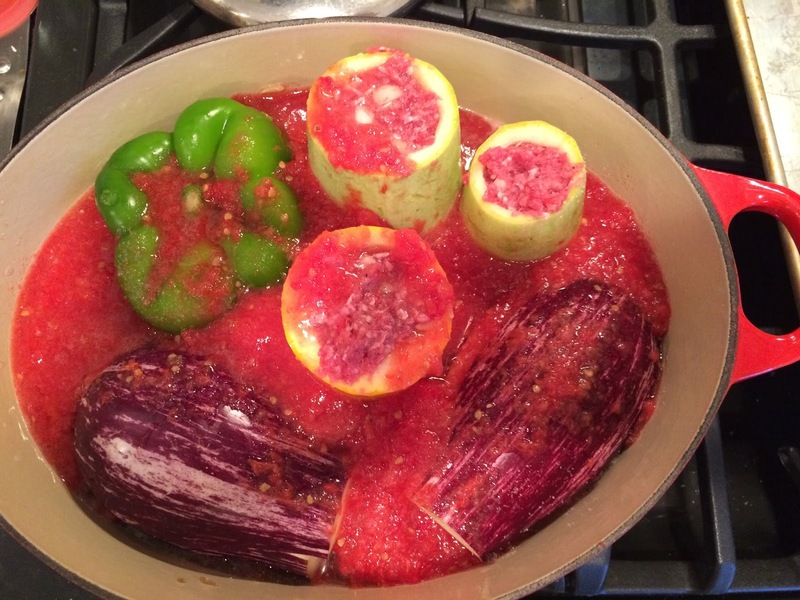 I’ve made dolma at least a dozen times before, but never with food from my own garden. Oh. My. God. 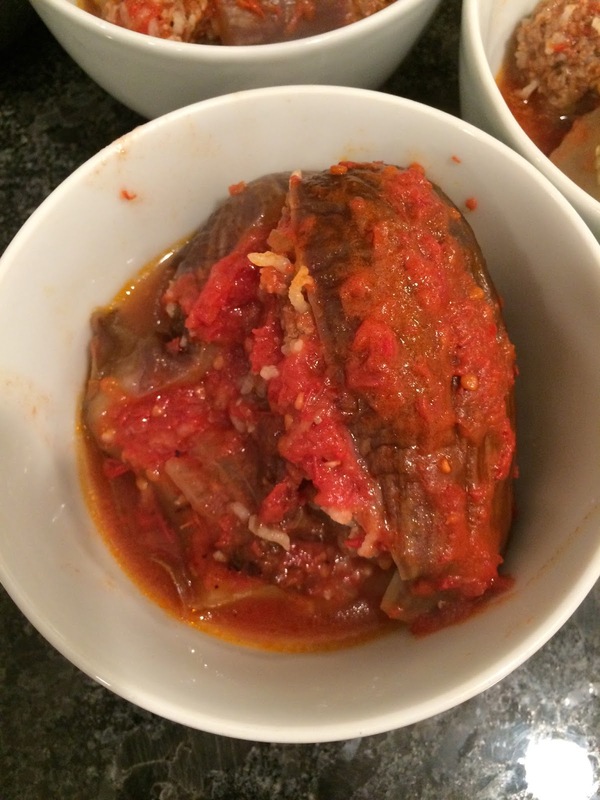 It was the best dolma I have ever had in my entire life, and my sister and husband agreed. I’m not kidding you. For all I know, this recipe will be terrible when you use middle-of-winter store-bought produce, and I will feel really badly that you wasted time making it. But, if you use fresh everything, and make it relatively soon, I have high hopes that you will be just as happy as I was. Before you continue, you might wonder what exactly was fresh. The squash came from a friend’s garden, and eggplant (graffiti eggplant, specifically) was from our garden. The tomato puree was made from the San Marzano tomatoes in our garden (just cored and pureed in the food processor. I think this was the game-changer). We bought everything else. A side note: this dish is gluten-free, in addition to being free of the 8 major allergens (milk, egg, wheat, soy, peanut, tree nuts, fish, shellfish). Hooray for almost everyone being able to eat it! If you use canned tomato sauce, or some weird kind of rice, just make sure to check the labels to confirm this fact. I made this again the other day, and it is still delicious (obviously). 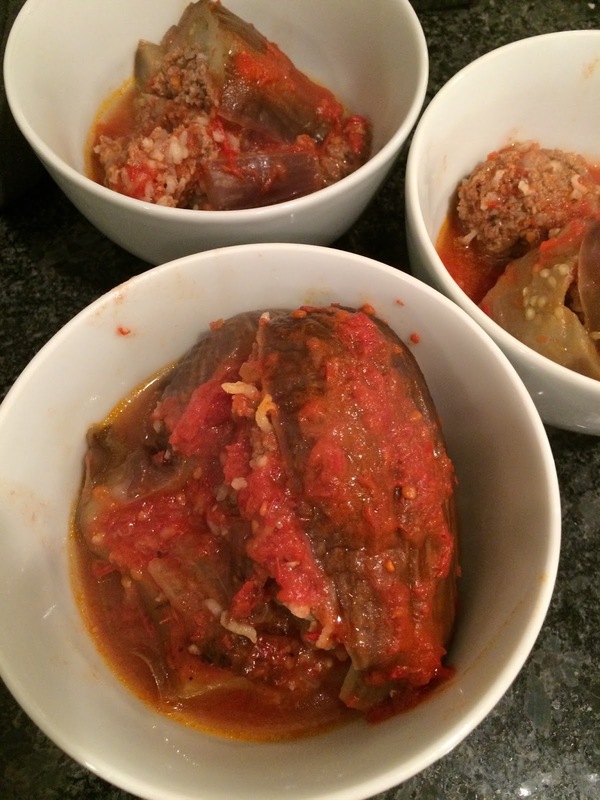 I stuffed some cabbage, which is one of my favorite forms of dolma. Just blanch some cabbage leaves in boiling water for 1-2 minutes, drain and cool. If there is a large, thick stem, cut the end of it out. Place 1-2 tablespoons of the meat mixture on one end, then wrap up like a burrito. Place seam-side down in the pot, cover with tomato puree, and cook. So good! Assemble your veggies. Hollow out the pepper, eggplant, and squash. Save the “caps” (I didn’t do that for the squash, but it’s not a big deal). To hollow out this squash, I just cut off the top, cut the inside, and then scooped out most of it with a spoon. It doesn’t have to be perfect. I used smaller eggplants (they taste better), and cut them lengthwise. Slice a thin piece off the bottom so it will sit flat in the pot. Hollow it out just like you did to the squash. Save the inside part of the eggplant and use it for something else (like making baba ghannouj). This is my beautiful tomato puree. It basically used almost all the tomatoes we had from the San Marzano plant. Add the ground beef, onions, tomato puree, rice, salt, and pepper to a bowl. Combine it with your hands. Put the hollowed out vegetables in a pot that is deep enough to hold them. None of the veggies should be taller than the pot. Stuff each veggie with the meat mixture. Yes, you may have noticed I added another squash here. Why not, really. If you have leftover meat, you can make little meatballs and tuck them into whatever free space you can find. Cover the veggies with their lids, if you still have them. Pour tomato puree into the pot, surrounding all the veggies. Cover the pot and simmer for 45 minutes. Here it is after cooking. Not much to look at, but trust me, it’s so good! We started with the eggplants. Mmmm. 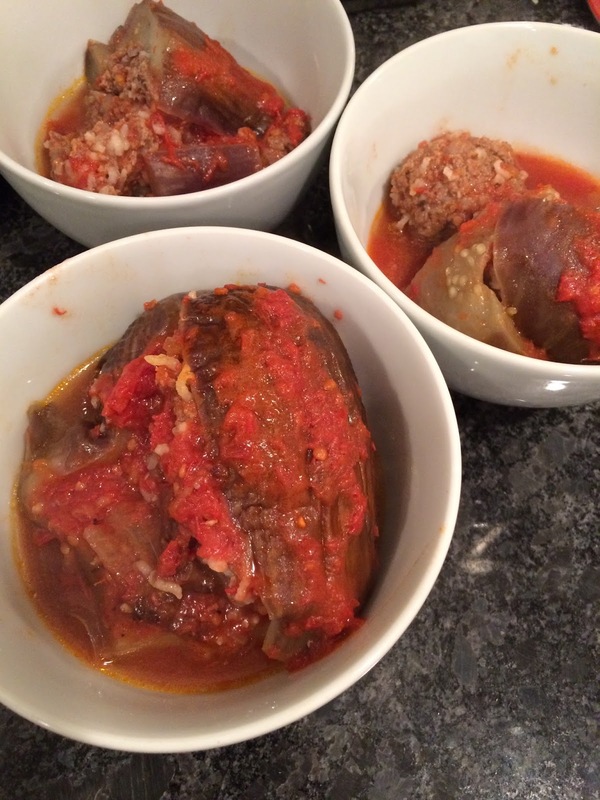 Vegetables stuffed with meat and rice, cooked in a tasty tomato sauce. Bell pepper: cut about 1/2 inch top off. Remove the seeds from the pepper, and rinse out the pepper if some seeds remain inside. Eggplant: cut the stem part off the end, then place it lengthwise on the cutting board. Cut a thin slice off of one side, lengthwise, to create a stable base. Cut about 1/4-1/2 inch, lengthwise, off the opposite side (the "lid"). Leaving about a 1/4 inch perimeter, hollow out the inside of the eggplant. Refer to the pictures if you're wondering how to do this. Squash: Cut off the stem side. Leaving about 1/8-1/4 inch perimeter, hollow out the inside. Again, refer to the pictures above if you're having trouble visualizing this. I cut the squash crosswise, in comparison to the eggplant, which I cut lengthwise. Slice a thin piece off the base so the squash can stand upright in the pot. If you have a long squash, cut it in half, and hollow out each half separately. Blanch the cabbage leaves: bring a pot of water large enough to fit the largest cabbage leaf to boil over medium/high heat. Boil the cabbage leaves in batches of 3 or so at a time for 1-2 minutes. Drain, then set aside. If there is a thick rib at the bottom of the cabbage leaf, cut it out. In a bowl, combine ground beef, 1/3 cup tomato puree, rice, onion, salt, and pepper. Mix with hands to combine. Fill each of the vegetables with the meat mixture, and place in a pot that is large enough and deep enough to hold them (I used a Le Creuset 5 qt pot). For the cabbage leaves, place about 1-2 tablespoons of meat mixture at one end of the leaf (I use use the cut end). Fold the end down over the meat, then fold in the sides. Continue to roll the leaf until you have rolled it up completely, almost like a burrito. Place it seam-side down in the pot. If you have leftover meat, make a few meatballs and place them in the pot. Put the "lids" on the veggies (I did this for the pepper and eggplant). Cover with tomato puree; it should come at least halfway up the vegetables. Put the lid on the pot and put on medium heat, turning down if the pot begins to bubble over. Simmer for 45 minutes, or until meat is cooked through. Serve each vegetable in a bowl with some tomato sauce. Top with a dollop of plain yogurt, and some sumac or Aleppo pepper, if you'd like. Use more veggies or fewer veggies, depending on your pot size and veggie size.